Aloha Towers #6A - Beautiful 2-bedroom condo, sleeps 6, washer/dryer and one free parking! You'll love this beautifully renovated (2014) 2-bedroom, 2-bath family-friendly condo (965 sq. ft. plus lanai) with central AC in a quiet, secure residential area of central Waikiki! - Japanese Live TV with more than 94 channels! Sorry, no pets. This non-smoking accommodation sleeps 6. Our contact met us right away and allowed us to check in a little bit early, which was great! It’s cozy and comfortable, accommodated 6 people well. Walking distance to Waikiki Beach... will definitely stay here again! Aloha and mahalo for taking the time to post a 5 star review and recommendation of this fabulous condo. We're delighted you enjoyed your stay! It makes our day to know our dedicated staff was able to make your vacation from start to finish a wonderful experience. We look forward to welcoming you back on your next Waikiki visit! I spent three generations with my family and my parents. The location and the rooms were also good, it was good that everything was in place. Convinient location and Good facilities. It was a convenient location to go anywhere.Bus stops,restaurants and shops are all nearby.washer and dryer are in the room so it was good to wash at any time. We coule not see the see from our room,but pool and barbecue terrace could be seen. The see is also conveniently located within walking distance.walking along the canal was also good. Great location, quiet, the beds were comfortable, felt like home with all of the amenities. The pool area was great and there were three private outdoor grills that were kept clean daily. It was next to a great neighborhood bar called Bacchus for LGBTQ community. Unfortunately there was a water leak in the building and we were inconvenienced a couple of times during our stay however, the management company took care of the issue while we enjoyed our Hawaii trip. Aloha and mahalo for taking the time to post a review and recommendation! We're delighted you enjoyed your stay and it felt like home! We do apologize for the building leak but we are happy to know our dedicated staff was able to make your vacation a great experience. We look forward to welcoming you back in the near future. A very clean apartment within walking distance to the beach and shopping areas of Waikiki. We had a car so the parking space was great. The location was really good for driving in and out of Waikiki. The kitchen had everything you needed to prepare a meal, the beds were comfortable and there were plenty of bath and beach towels. The washer and dryer were well used and not too noisy. The ABC store on the corner was good for milk, fruit etc (cheaper than the store downstairs). Captain Cook Resorts were great to deal with. - professional and helpful. Aloha and mahalo for taking the time to post a review and recommendation of this fabulous condo. We're delighted you and your family enjoyed your stay! It makes our day to know our great accommodations and staff were able to make your vacation from start to finish a wonderful experience. We look forward to welcoming you back in the near future. Close to everything, easy to get too. Condo was clean and well stocked. We enjoyed our stay at Aloha Tower. James greeted us to allow us into the unit and showed us the unit along with giving us instructions. We really liked our stay and will definitely go back! Mahalo for taking the time to post a great review and recommendations of this wonderful condo! 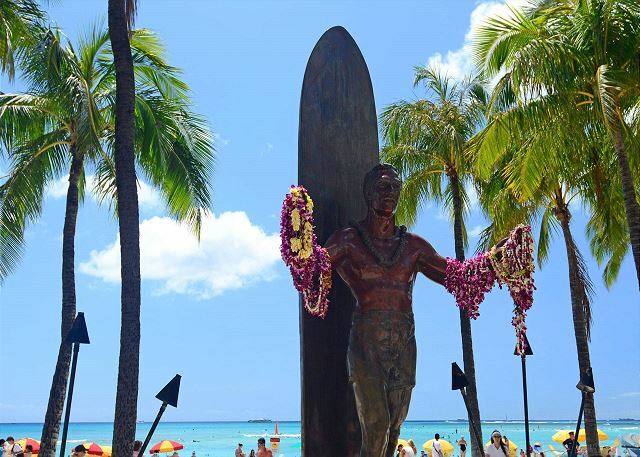 We're glad you enjoyed your stay and look forward to welcoming you back on your next visit to Waikiki! Enjoyed the size of the two bedroom, kitchen was very well equipped for cooking.Good location and the building is kept up daily. Overall a good experience. We stayed with my parents at this two bed-two bath apartment. It was very enjoyable. It overlooks the building's BBQs, pool and tennis court. The location was great and we were able to walk down to waikiki beach. It was nice to have a washing machine and dryer. It was a fully equipped kitchen so we were able to make coffee and breakfast. We also used the BBQs a couple of times. Mahalo, for choosing to stay with Captain Cook Resorts during your recent visit to Hawaii. We are delighted you appreciated the location and we were able to provide for all of your needs for a relaxing and memorable vacation. We look forward to seeing you again soon. We had a lovely time at Aloha Towers. The apartment was very comfortable, the kitchen and bathrooms are updated and there was plenty of space for two couples. It is located in a good part of Waikiki with lots of amenities near by. Having the parking space in the building was very helpful as we rented a car. Mahalo, for the 5 star review and recommendation! We're so pleased that you appreciated the location and free parking at this fabulous condo! Thank you for choosing to stay with Captain Cook Resorts, we are delighted your visit was enjoyable! Hope to see you on your next visit to the islands! We were a group of five that enjoyed the ideal location in Waikiki. Captain Cook took great photos of this unit. It was clean with supplies to maintain the kitchen, bedrooms and living space. Rental property manager was available to reply to our concerns within 24 hours. Mahalo, for taking the time to post such a great review and recommendation! It’s always encouraging when customers acknowledge the good work of our team and know that you enjoyed your stay. We look forward to seeing you again soon. We arrived late night q and had trouble with the air conditioning struggling to keep up. Byron had a contractor in the next day. When it turned out it needed a part (several day delay) Byron took action and got us in another unit, which was a definite step up for our troubles. As a homeowner I know those things happen, but it was great Byron acted to resolve to our satisfaction+. Mahalo for choosing to stay with Captain Cook Resorts and for taking the time to post your review and recommendation. It’s always great to get this kind of feedback and encouraging when guests acknowledge the good work of our team. We look forward to seeing you on your next visit! This was a great find for us. Family vacation with two teen sons was a blast here. Plenty of room for all of us, and a prime location. One block from Waikiki and easy to get on the highways to explore other parts of the island. What a bonus the included parking space is, for sure. I visit Hawaii a lot, as I am from there, and I have to say this was one of the top places I have stayed so far! Definitely booking this again. It makes our day to read such an enthusiastic review, Mike - Mahalo! We’re happy to have provided all of the needs you required for a fantastic family vacation! We're so glad your visit was enjoyable and look forward to seeing you again on your next visit. Recently rented this unit for 5 adults and 1 infant. Great location, safe area and close walk to beach, shopping and markets. Small issue with the AC that was eventually resolved. Pool was clean and well cared for as well as BBQs. Overal would recommend. Mahalo, Pamela, for the wonderful review! Hope you are able to plan a return trip soon! Great stay, was as described. They had lots of children's toys, beach chairs, and beach towels for use. Property was in good condition and good proximity to the Waikiki beach area. Construction going on in a nearby location during daytime hours so expect some banging - didn't bother me. Aloha Satinder! Thanks so much for leaving such a great review and recommendation. Happy to have provided all of the needs you required for a wonderful family vacation! It's what we're here for! Hope you can enjoy a return trip to our beautiful islands soon! Excellent. The condo was everything as outlined and more. The condo was very spacious for our family of 4. Great location/only a short walking distance to the beach and shops. Kids loved the pool and great barbecuing facilities. Would highly recommend this suite. Mahalo for the 5-star review, Jana! So glad to hear you enjoyed your stay in this great condo! We look forward to your next visit! Our week stay at this condo was perfect. Plenty of room for the 3 of us, the kitchen and all the amenities that came with it came in very handy. The free parking didn't hurt either. 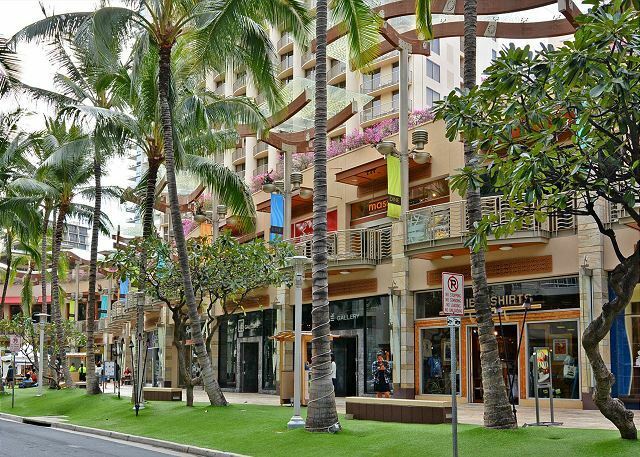 The location was a couple blocks from Waikiki beach and all the shopping stores. Overall, we highly recommend this condo and would definitely book again. Thank you for a great experience. Mahalo for the 5-star review, Clint! So glad to hear you enjoyed your stay in this great condo! We look forward to your next visit! A bonus was having kids beach toys in the unit. Mahalo, for the great review and recommendation! We continually strive to improve our services and your comments and suggestions are extremely important to us. We look forward to welcoming you back on your next visit! Simply fantastic. Very complete and excellent location department. Thank you for choosing Captain Cook Resorts, glad you had a great time! We look forward to having you back for your next vacation! Ideal location close to Waikiki without being too busy with passing traffic. Easy access to shops and supermarkets as well as many food outlets and only a short walk to the beach. Although A/C was old and not really cold the large fans provided excellent cooling particularly when sleeping at night. Mahalo for the great review, John! Hope you're able to return soon! We really enjoyed our stay at the Aloha towers 6A. The location was perfect. The condo has everything you need and is only 1 floor up for the pool. I would recommend this condo and would consider renting again when we come back!!! Mahalo, Christina! We appreciate the recommendation! The rental unit was very roomy and clean. It was perfect of a family of 6. We had our own parking stall which is a bonus specially in Waikiki. The beach is within walking distance. We were happy and if staying in Waikiki we would book the condo again. Mahalo, Teo! We hope you ARE able to return to visit again! Great location with everything suppled! This gem of an apartment was perfect for our family of 4. Kids (teenages) had their own bedroom and bathroom. Apartment had everything we needed included such as beach towels, sponge and washing liquid for kitchen and dishwasher, laundry detergent and a good supply of toilet paper. They even had body surf boards and equipment for snorkling. Two balconies to hang beach towels and lots of pegs to hang washed clothes as well. There is a washing machine/dryer but I found the washing machine didn't spin all the water out of the clothes, so I opted to hand wash. Dryer worked well but I prefer clothes to dry on the balcony. Location great, close to main street and probably 10 minute walk to beach which was easy. Had our own parking spot and wifi was great. Both rooms had a TV plus one in the lounge room. Would recommend to anyone staying with family. Mahalo, Arthur, for the 5-star review! And thank you for calling our attention to the washing machine needing repair - we'll get right on that! So glad your whole family enjoyed staying with us at Aloha Towers! Hope you're able to plan a return trip soon! The unit was everything as described. It was exactly what I needed for my 13 yr old triplet grandkids and myself. We were close to the beaches and all the action on Waikiki so we could walk to everything. Mahalo, Paul, for the great review! Glad you and your grandkids had a great time! You are all welcome back any time! We thoroughly enjoyed our stay in the Aloha Towers. Close to bus stops, great local restaurants, shopping and the beach. Mahalo for the great review, Mike! Glad to hear you found the location of Aloha Towers so convenient, too! Hope you're able to plan a return visit . . . we'd love to host you again! We had a great time staying at this property. There was plenty of room and the location was perfect. We would definitely stay there again when we travel to Hawaii. The property manager was very flexible meeting us after we arrived in the islands and made us feel very welcome. Mahalo, Mark! We're glad you enjoyed your stay with Captain Cook Resorts and hope you can visit us again soon! We had great vacation time in Honolulu with Aloha Towers #6A. Location of the condo and layout of #6A was excellent. In addition to those, all rooms were clean and very comfortable to stay. We would like to come back again when we have chance to revisit Honolulu. Also, strongly recommend the condo/room to anyone who wants to find out a good condo in Honolulu. Mahalo, Haruki, for the great review and recommendation! We appreciate it! We hope you do get a chance to revisit Honolulu - see you then! Great experience. Accommodations were perfect for my family of 4. Great Location and free parking! We were two couples traveling together and the condo was perfect. It was easy to get around from the location and there was also plenty within walking distance. We will absolutely stay here again when we return. Mahalo, Amy! So glad you enjoyed your stay! We look forward to your next visit! Mahalo for the review and recommendation, Betty! We hope to see you again someday! This two bedroom condo worked out perfectly for our stay in Waikiki. It's centrally located and a quick walk to the beach, restaurants and shopping. Byron, the property manager, was prompt and helped us settle into the place. One item to note, they are completely renovating the condo next door which caused construction noise throughout the day and into the night. Mahalo for the review and recommendation! Well furnished apartment in a close to main shopping and Beach Walk. Mahalo, Allan! We hope you can return for another visit soon! Family of five stayed 5 nights. Check in process went smoothly, Byron met us at the in-door parking lot and made sure we settled in after a long journey. Attractive renovated 2 bedroom condo in a great location. 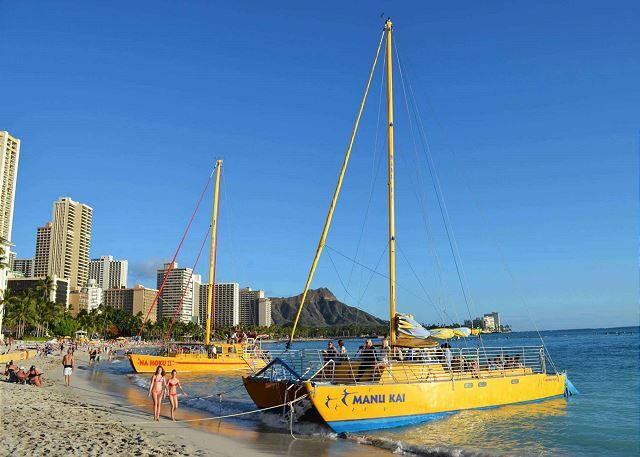 Everything Waikiki has to offer is a short walk away. Very quiet area and great to have the bbq grills in the courtyard - just like home. If you rent a car the free parking is a bonus, we did our grocery shopping at Safeway - great produce and much cheaper than the ABC. Mahalo, Mark for the great review! We're glad you all enjoyed staying in this beautiful condo! Aloha, Kathy, and than you for taking the time to post feedback about your recent stay! We're glad you chose Captain Cook Resorts for your first vacation rental and will look forward to seeing you again one day! We had a great time staying in Aloha Towers Condominium unit 6A for 9 nights. The unit was beautiful just as you see on their website. It was clean and ready to be used and large enough for 6 of us (4 adults and 2 small children) to stay comfortably. Byron went over and above to meet our needs. We will definately look them up again next time we visit Waikiki area. Mahalo! Lovely condo in great location, everything clean, modern and with a nice stash of beach toys and towels for ocean fun. We had a brief problem with the faucets not working well but we called the management company and they resolved the problem right away. First-floor store was a great convenience. Only small quibble would be that the twin beds were a bit uncomfortable. Mahalo, Heather, for the great review and recommendation! Hope to see your family again sometime soon! Overall experience from reservation process to check out was fantastic. It was our first time in Waikiki - we thought the location of the place was fantastic. Easy walk for my family (i was travelling with a toddler) to restaurants, shopping and beach. Plus point was a free parking spot for our car. made good use of the poolside bbq, swimming pool and spa. Checking in was easy, called the property manager Byron who met us at the building. Byron was very pleasant to deal with, and dealt with a problem in the unit very promptly. Mahalo for choosing to stay with Captain Cook Resorts and the great review and recommendation! We're so glad your visit was enjoyable and look forward to seeing you again. We will pass your feedback on to your property manager, Byron; he's a real asset to the Captain Cook Resorts team! This is my first time in a vacation condo and it won't be my last! Clean, clean, clean and comfortable beds too. The location of the store on the first floor to pick up items that I needed was so very convenient and the location to local shops and restaurants made me glad I didn't rent a car. We walked to most of the things we wanted to do and took the bus to the other places. I don't think I will look for another place to stay when I return because I found my perfect place. Mahalo for choosing to stay with Captain Cook Resorts and the great review and recommendation! We're so glad your visit was enjoyable and look forward to seeing you next visit! Loved it, will defiantly go back and would recommend to any one. Daughter left her glasses there and they sent them back straight away. Thanks Byron. This place was really nice!...I just want to thanks Wendy from being so nice with me answering all my questions when I made the reservation and also to Byron who made our check in ...everything was perfect and the apartment has everything you need...just a few blocks walking you have a lot of brand famous stores to shop and fine restaurants.... You will love it! Mahalo for choosing to stay with Captain Cook Resorts and the great review and recommendation, Sandra! We're so glad your visit was enjoyable and look forward to seeing you again. We will pass your feedback on to your Wendy; she's a real asset to the Captain Cook Resorts team! 4 people staying for 5 days, this definitely beats a hotel room with free wifi and parking space. Comfortable,spacious well maintained grounds in poolside/spa/sauna. Master bedroom very nice, twin beds not so comfortable, kitchen facilities very good. We'll consider using Captain Cook's vacation rentals again. 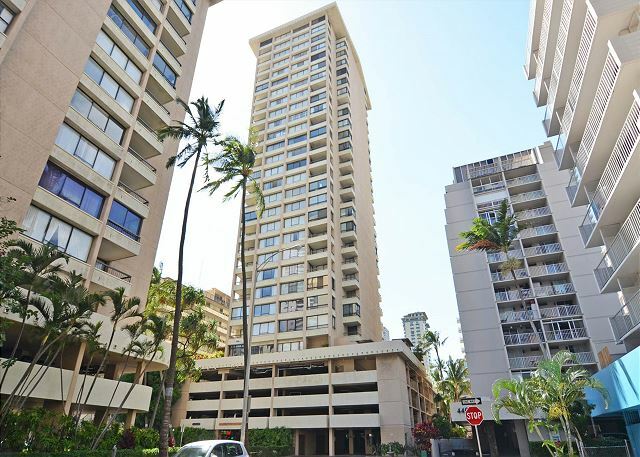 The condo was very well situated to all Waikiki shops and restaurants and to all highways. We had a car and the parking spot was awesome to have since parking was difficult to find.The condo itself had everything that we needed and was comfortable, clean and safe.Our unit 6A overlooked the pool area which was kept absolutely spotless. Very lovely! Great accommodation very close to everything for our needs. Included Wifi, parking and almost everything you could ask for in the rooms. A home away from home. Highly recommended. Thank you for all your help. We all enjoyed our stay. Mahalo for choosing to stay with Captain Cook Resorts and the great review and recommendation! We're so glad your visit was enjoyable and hope you'll be able to return for another visit soon! Feels like home away from home. 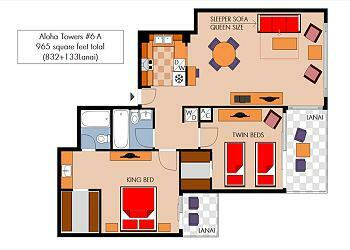 Nice rooms, comfortable beds, kitchen well equipped. Short walking distance to everything. The washer/dryer is a plus. Ample bath and beach towels included as well as beach toys if you bring kids. The lanai overlooks the BBQ/Pool/Hot tub area. Property management was friendly and courteous. We're so glad you and your son enjoyed staying at Aloha Towers 6A! We look forward to your next visit! Enjoyed every minute of our stay! The condo was beautiful, clean, and so relaxing!!! Great property, great location !!! The unit was great! It was clean, well maintained and in a great location of town. We had a blast there and really enjoyed the convenience and comforts of this unit. Thank you. This place was great; very clean and centrally located (about 10 mins walk from main beach / shops). Sleeps 6 - two double beds and two single beds. Thie condo was beautiful and well equipped with everything you could possible need for a vacation or short term rental. The decor was serene and relaxing in the middle of such a busy city. We will definitely be using Captain Cook Real Estate again! This condo was absolutely perfect!! The property was exactly as pictured in its description. Everything was brand new....even the furniture! It was beautifully decorated and it was like being at home. It had everything we needed....we didn't have to call the property manager one time because everything was there and so well organized. He even came in on his day off to get us checked in because the other person was with another client. Now that's great customer service! He was very friendly and welcoming. It was so clean and nice....and only a few blocks from the beach and shopping! It was perfectly located because we were close to the action, but far enough away to where it was quiet. We also used the pool and jacuzzi! It was very private. My brother is going to Hawaii next year and I am recommending he get this same condo. It is so perfect for families. We cooked meals, played cards, watched TV and did a few loads of laundry so we didn't have to pack dirty clothes for the flight home. It really was like being at home. We had 5 people stay there and it couldn't have been more perfect for our family! Thank you so much! I feel we got very lucky getting this beautiful condo. It also had 24 hour security, a key fob to gain entrance into the building, and had its own parking space. The parking space alone saved us over $100.00. Apartment was great. 4 adults and 2 children stayed with enough room for all of us. Location is so so as it is about a 10 minute walk from the beach/centre of Waikiki but was a safe and easy walk at night. The apartment had a pram and beach toys for the kids + beach towels for everyone which was great. It had everything we needed for a great stay. There is also a convenience store below the building that was always open when we walked in/out. Manager was professional and friendly. We needed another parking space which is a premium in Waikiki but he went out of his way to get us one. Very good apartment, clean and with all mod cons in a very central part of Honolulu and Waikiki, will definitely stay here again. it was nice stay ! First family trip to Hawaii and everyone had a great time. Located about three blocks from the beach so an easy 10 minute walk and your in the water. Quiet building and far enough away from the beach walk to not feel overwhelmed by all the tourists. Plenty of room for the five of us to sleep and relax comfortably. A very pleasant and efficient service by all the staff at Captain Cook. The property was exactly as described on-line when I booked. It is about to be refurbished so will be excellent from November onwards. The condo is in a great location - easy walk to the beach and all Waikiki attractions. The unit, pool, and BBQ area was clean and well maintained. We had a great vacation and would rent this unit if we vacation again in Honolulu. This was the perfect condo for us (two couples). One of our party had meetings at the Convention Center. Easy walking distance. We did not have a vehicle, and one was not necesssary for the beaches, night life, bus shuttles (ie: Pearl Harbor). Unit was quiet, balconies provided open breeze, hot tub was hot. Manager met us upon arrival, and was very professional. We would stay here again. Rental was in good location-walking distance to shops, restaurants, convenience store located on ground level and ABC store just up the street. Walmart and Ala Moana Mall less than 7 minutes away by car. Condo was clean overall. Soap, dishwashing & laundry detergent provided. Slight problem with master bedroom bathroom, we initially had to turn on the water for the toilet to work and the cord in the tank was loose. Byron from the rental agency was very accommodating, my family really appreciated all his help. Good location, great space for a family with kids. For the price I would expect that the blinds be replaced, the sliding doors not allow so much night noise through, and the areas under the furniture be cleaner. Much bigger than the typical hotel condo. suite needs a "face lift"
Because insects thrive in Hawaii's warm climate our units are regularly treated and maintained to prevent any level of infestation. We have a zero tolerance policy concerning bugs and act promptly whenever necessary. The new owners are in the process of getting estimates for a complete "face lift" that will soon be scheduled. We arrived at the apartment four days prior to Christmas, five adults and our grandson aged 5 years. We found the apartment was more than adequate to allow our grandson room to play while not interferring with the adults doing what they preferred to attend to at the time. All the facilities offered, such as the tennis court, the pool, the outdoor area, the parking space and the services available within the apartment such as the oven, the dishwasher, the washer and dryer were all used during our sixteen days there. The location was excellent, close to everything including the beach, the shops and the public transport all added to our enjoyment. The Management and the Staff were always helpful while no being intrusive. My sincere thanks to everyone involved. In passing, the dishwasher needed some maintenance, but this was quickly attended to within hours of reporting the matter. Well positioned apartment only minutes to Waikiki and lots of restaurants. Apartment is showing it's age but was clean and comfortable. Furniture was good, kitchen well appointed and there was plenty of clean linen. Overall we were very happy with the apartment and would be happy to stay there again. L'endroit est super pour séjourner à Honolulu. Très proche des activités, des restaurants et de l'aéroport ainsi que des accès routiers. TRANSLATION: The place is great to stay in Honolulu. Very close to activities, to restaurants and to the airport as well as to road accesses. Byron from Captain Cook was very helpful during our stay, he contacted us on several occasions to ensure we were happy with the accommodation. The condo was clean and had adequate facilities for 3 adults. It is well located and the building is secure and well maintained. The condo is showing its age and would benefit from an update, things like the coffee maker and toaster need to be replaced. Overall we were very pleased with the facilities and would recommend to anyone wanting a central Waikiki 2 bedroom condo. Captain Cook Resorts and in particular Byron were very professional to deal with. A few things need updating but overall a good place and location. Plus points go to great pool/deck area, BBQ facilities, free parking and security. Really enjoyed our stay at the condo. It's a bit further out, but this meant a fairly quiet location, but still within walking distance of the main attractions in Waikiki. Our manager, Byron, was very helpful, considering our flight was delayed by over 2 hours and we arrived at the condo at 12.30am! Thank you very much for a great stay, would not hesitate to stay here again. If we had been notified of the problems the guest was having we would have addressed them immediately. We treat our units for roaches, and other pests, on a regular basis but they still may appear on occasion. We have scheduled this unit for retreatment. We did find the internet not to be working but it only required rebooting. We spoke with the building manager about the smell of mildew in the hallway outside of the unit and he said they will try to remedy it. A comfortable stay, not new but well cared for and clean. I would stay there again. We have replaced the king mattress in the master bedroom. The stay was very pleasant. Paul who checked us in was very friendly. Our flight was delayed, he waited for us till midnight. We really appreciated. We had a very comfortable and enjoyable stay. Location was central to all sites and beaches. The pool, hot tub, sauna, were excellent. Grills for cooking outside a plus. Easy check in and out. A few gliches, but nothing major. Vertical blinds were a pain - do not work properly. One patio door would not open. Enjoyed the balcony for sunrises and sunsets. A great place to hang loose and kick back. No problems. 4 of us stayed and there was plenty of room. The condo was clean and in good condition. It suited our extended family of 6 just fine. We rented a car so it was wonderful to have an included parking space. In need if new mattress and furniture. No T.V. in the smaller bedroom. With the 2 twin beds you have no space for night stand or to get to the closet. We wouldd love to stay again if upgrades were made. The mattress has recently been replaced. TV and DVD has been added to the guest bedroom. Apartment Block - This apartment is very conveniently located on Lewers Street and the staff at the site are helpful and friendly. The pool and barbeque areas were meticulously cleaned every day. However, I would not recommend staying in this apartment if you have issues with decor (it generally looked tired) and you are fanatical about cleanliness. It needs a really decent clean (carpets, floors etc). Also, the mattress in the main bedroom has not been replaced and is in desperate need. We were there for over 2 weeks and every night was an uncomfortable sleep! The main bedroom mattress has been replaced. Our standards are to have carpets cleaned monthly. Housekeeping has done a deep cleaning. We are sorry that we were not called during your stay as we would have been happy to address these issues. Each condo reflects the owners individual tastes. We will discuss this review with them and they may wish to change the decor. The location of this unit was by far its best asset. In close 2nd is Paul, the nice guy who met us there and oriented us to the place. The parking garage was a bit of a challenge, just because of space, but what do we expect on an island? Sofa bed not so comfy... would upgrade to 3 bedroom for 5 people. Overall, great stay! We are with our 1 year old and the apartment was the coolest thing we opt for. Nice location, friendly manager and very close (3-5 blocks) to Waikiki beach. great location, very big unit, great for a family of 5. the trash chute in the hallway was a but smelly, but everything else was awesome! Agree with all the previous positive reviews. Great location, short walk to Waikiki beach. We rent a car so the free parking is nice. Comfortably sleeps six (4 adults and 2 kids, using the sofa bed in the living room). The only complaint, if any, would be that there is a trace of wet smell in the kitchen cabinets. We are sending maintenance to check if there is a leak. What a fantastic condo to inhabit while on vacation. For the price, it's so great. It's a bit dated, but it's clean and comfortable. The spacious closet in the master bedroom was perfect for putting our 1 year old's crib in it, like it was another room. It was such a convenient location as well. Great place. This place was good for my family and girlfriend. They had plenty of extra towels and snorkel gear. On-site laundry was crucial. I will say though, that while the place seemed clean, I kept feeling like it was a bit dusty. I have a dust allergy and could tell that the place could use a good dusting or a thorough clean. Also, the beds are pretty uncomfortable. Overall I would recommend though. This building has central air conditioning and we have checked the filters to see that they are clean. The condo was cleaned prior to the guest's arrival and we are sorry that there was a problem due to guest's allergy. We scheduled extra cleaning after learning of this. The owner is in the process of replacing the beds.